I crave juice. No, not apple, orange, or any other fruit drink -- I am addicted to electricity. Look, we are all hopelessly dependent on our mobile devices these days. Between laptops, smartphones, and tablets, there is hardly a moment in the day when I'm not staring at a screen. Even when I am watching TV (yet another display), I have my iPad in hand for a second screen experience -- I play a lot of Words With Friends while watching The Big Bang Theory reruns. All of this heavy device usage at home is fine, because there are many power outlets available when batteries get low. When I am on the go, however, it is a very different story. All joking aside, I get anxiety if I'm out of the house and my iPhone battery dies. What if I get lost? What if I need to call 911? What if I need to snap a quick photograph? A nightmare! Thankfully, USB power packs/banks can solve this dilemma. If you aren't familiar, it is simply a battery with a USB port (or ports) that can charge your devices. With all of that said, a USB power bank is old hat, right? I mean, there's no reason to get excited about them anymore... right? After all, I see them sold on the counters of convenience stories nowadays. Seriously, when buying some beef jerky at 711, I see them just sitting there next to candy. The truth, however, is those low-cost USB power banks are typically trash -- almost disposable, with low mAh, and just a single port. In other words, not all of these battery packs are created equally. Actually, I have been testing a new premium power pack from Omnicharge. As part of its new "Mobile Series," the model I've been using offers an impressive 12,800mAh. You know what? 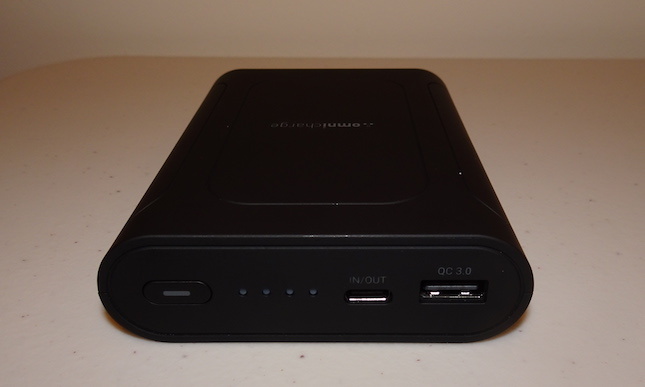 It is one of the best USB power banks I've ever used. Let me tell you why. Please note: The 13000mAh listed on the packaging in the above video was apparently just an error -- 12,800mAh is correct! As you can see in the video above, as soon as I touched the Omnimobile, I was impressed. The body is plastic, but it is extremely smooth, creating a very pleasing touch experience. Call me crazy, but it rewarding too simply hold it in your hand. There actually is some function to this silky texture -- it can easily slide into your pocket. Believe it or not, it is not too large to sit comfortably in your pants. All of the magic is on the front -- a power button, LED battery level indicator, a USB-C port, and a USB-A port. I know what you are thinking -- how do you charge the Omnimobile itself? Well, that USB-C port does double duty, providing both input and output. In other words, the port is intelligent, knowing whether it needs to charge a device or charge itself. Very cool. As you can expect, both USB ports can be used simultaneously. If you and a friend or family member both need to charge your phone, you both can at the same time. You can also charge a device using USB-A while also charging the Omnimobile with USB-C. The magic, however, is that the USB-C port can charge laptops. Yes, this power bank is powerful enough to charge a notebook -- including Apple's MacBook! In my testing, the HUAWEI MateBook 13, when connected to the Omnimobile, indicated it was plugged into the wall. It started charging immediately. 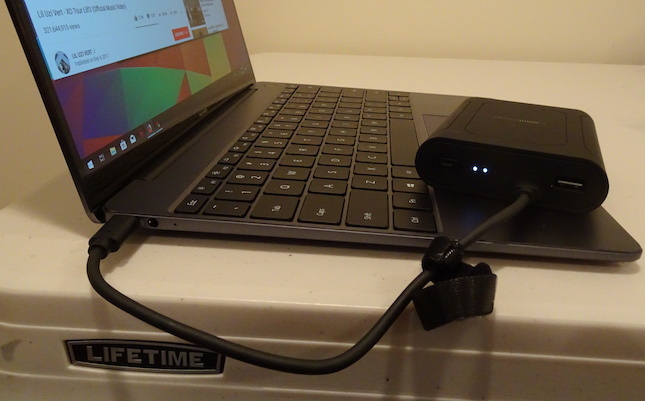 As a test, I played several YouTube video in full screen while connected to the power bank, and believe it or not, the laptop's battery level went up! I thought that maybe it would just keep the battery at the same level, or slow down its decline, but no, it actually increased the notebook's battery level while in use! The Omnimobile sounds great, right? Yeah, but I haven't even discussed one of its coolest features -- Qi Wireless charging! Yes, you can simply place your compatible smartphone on top of the power bank -- no need to use the USB ports at all. This worked quite brilliantly, charging my iPhone 8 Plus without issue. 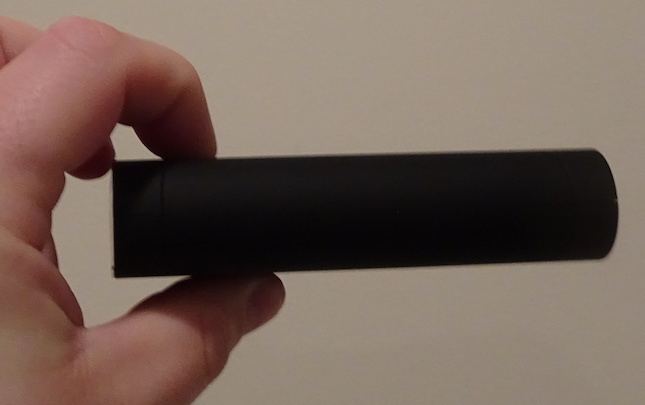 True, this isn't the only USB battery pack with that feature, but it is still impressive. Can you imagine what I had to do next? Yup, try to charge three devices at once. I connected the Omnimobile to my laptop using USB-C, an Android smartphone using USB-A, and then put my iPhone on top to charge wirelessly. It worked. All three devices were charging at once! Unfortunately, as you can expect, this drained the power bank very quickly. With that said, that isn't likely to be a common use case scenario. Overall, my experience with the Omnimobile has been positive, but there are a couple negatives. The most glaring is that it does not ship with a USB power brick. Yeah, out of the box, you can't even charge the Omnimobile! True, most consumers have several such chargers laying around, but still, it annoys me. The other downside is that it can take a very long time to charge the Omnimobile. This could be due to the USB power adapter I am using with it, but hey, since Omnicharge doesn't include one, what else can I do? My advice is to charge it overnight while sleeping so you have it ready to go in the morning. Despite these minor concerns I recommend the Omnicharge Omnimobile without hesitation. Quite frankly, everyone should have such a power bank for their bag or pocket -- it can be a godsend. That this high-powered USB power pack can both charge laptops and provide Qi Wireless charging makes it a smart choice. Build quality seems great too -- it should last. If you want your own Omnicharge Omnimobile power bank, you can back it on IndieGogo here. There are several models from which to choose, with various ports, mAh capacities, and prices. If you want the one I reviewed above, however, you should choose the 12800mAh model for $69.99 -- that is $30 less than its eventual $99.99 price.